The East St. Louis 1917 Centennial Commission and Cultural Initiative (CCCI) is undertaking crucial work to help heal historical wounds, celebrate survival and advance the town’s quality of life, according to Southern Illinois University Edwardsville alumni and faculty, who serve as CCCI commissioners. This year marked the 100th anniversary of the 1917 Race Riots in East St. Louis, and news of CCCI’s efforts is “rippling throughout the world,” said Eugene B. Redmond, SIUE emeritus professor in the Department of English Language and Literature, and Poet Laureate of East St. Louis. The centennial year began with a commemorative program hosted at Forest Park Community College in January. Saint Louis University spearheaded an educational conference from May 26-28. During the formal programming from June 30-July 2, the Commission observed the lowering of the St. Clair County flag to half-mast in a ceremony at the courthouse; blessing the site of the first monument in honor of the victors and victims; a cultural/artistic salute and the silent march to Eads Bridge culminating with the laying of the wreath. Additional events and observances will be offered in September and throughout the year. Times, dates and locations will be disclosed later. The non-profit CCCI also has plans to help establish a historical society and history museum in East St. Louis. “Our work as a Commission is critical, because the earth has a memory,” said Darlene (Duncan) Swanson Roy, 2017 Golden Graduate who earned a bachelor’s in sociology/psychology from SIUE in 1967. She is president of the Eugene B. Redmond Writers Club, and author and associate editor of Drumvoices Revue, an annual anthology formerly published by the Club and SIUE. “Yes, and giving Earth the blues …,” bemoans Redmond, quoting a line from one of his multitude of poems. “As commissioners, we are unfortunately addressing an important issue which history books and oral histories have failed to emphasize,” said retired Circuit Judge Milton Wharton, an SIUE alum. Wharton earned a bachelor’s in business administration/management in 1969, was named to the SIUE Hall of Fame in 2010, served as a member of the SIUE Foundation Board of Directors, is a past-president of the SIUE Alumni Association Board of Directors and was named the SIUE Distinguished Alumnus of the Year in 1998. Anne Walker, who achieved a bachelor’s in communications and theater in 1973. She is director of Freedom Trails, Legacies of Hope and is the former executive director of the Katherine Dunham Museum. 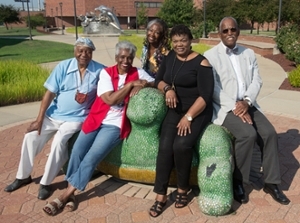 SIUE Centennial Commission and Cultural Initiative Commissioners are pictured at the East St. Louis Higher Education Campus on the sculpture artwork of Edna Patterson-Petty. From L-R are: Dr. Eugene B. Redmond, Edna Patterson-Petty, Anne Walker (on top), Darlene Roy and Judge Milton Wharton. 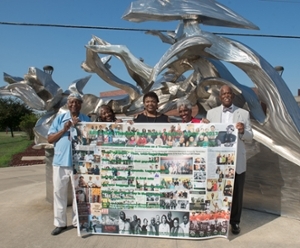 SIUE Commissioners are also seen holding a photo and poetry collage representing the work of the East St. Louis 1917 Centennial Commission & Cultural Initiative, photographed and made by Dr. Eugene B. Redmond. Shown from L-R: Redmond, Walker, Roy, Patterson-Petty and Wharton.